Harris Corporation’s new Falcon® RF-330E-TR Wideband Rifleman Team Radio meets, and in many cases, exceeds the requirements for the Rifleman Radio Program, recent independent tests show. The requirements are defined by the Production Requirement Documents for the program. Harris’ Falcon® RF-330E-TR was tested by the Network Battle Lab for Experimentation (NBL) at the Cyber Center of Excellence in accordance with a Commercial Testing Agreement signed by the two organizations. The testing was conducted by personnel assigned to the NBL and by soldiers from the 15th Regimental Signal Brigade. Secret and below access for every squad member The RF-330E-TR Wideband Team Radio provides a long-lasting, lightweight, handheld connection to the wideband network—including secret and below information. As the first fielding of Harris Embedded Modular Radio (EMR) technology, it provides an innovative and lower cost way for every warfighter at the tactical edge to get the wideband advantage. 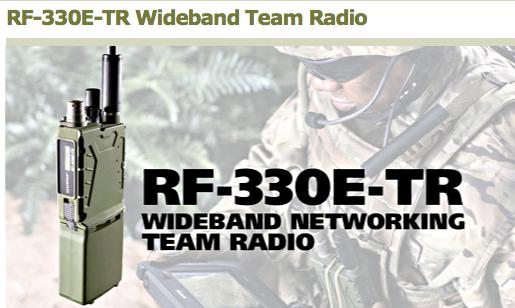 The RF-330E is a lightweight, wideband, networked radio that connects front-line soldiers to the tactical internet. It facilitates command and control by providing voice, data, and location information throughout tactical networks. Harris will showcase the radio at the 2014 Association of the United States Army conference October 13 – 15 in Washington, D.C.
Harris RF Communications is the leading global supplier of secure radio communications and embedded high-grade encryption solutions for military, government and commercial organizations. The company's Falcon® family of software-defined tactical radio systems encompasses manpack, handheld and vehicular applications. Falcon III® is the next generation of radios supporting the U.S. military's Joint Tactical Radio System (JTRS) requirements, as well as network-centric operations worldwide. Harris RF Communications is also a leading supplier of assured communications® systems and equipment for public safety, utility and transportation markets, with products ranging from the most advanced IP voice and data networks to portable and mobile single- and multiband-radios. Harris is an international communications and information technology company serving government and commercial markets in more than 125 countries. Headquartered in Melbourne, Florida, the company has approximately $5 billion of annual revenue and about 14,000 employees, including 6,000 engineers and scientists. Additional information about Harris Corporation is available at harris.com.